We accept Paypal (Visa, Master card and bank account) and Direct Deposit. Both of these payment methods are user-friendly, highly secured and extremely efficient. Order number must be included as a comment with the payment. We also accept Cheque and Money Orders. Order number must be included with the payment. Please note that orders by cheque are not processed until the funds have cleared which may take up to five working days. Please visit How does Paypal works? Yes, you can pay by using your bank card or credit card via Paypal. You will need to make payment for your order in 3 working days. We will send a reminder to your billing email address. If we do not receive any reply from you we may cancel your order . But do not need to worry, you can make a new order if your order has been cancelled. Caulfield, VIC. See above for details. 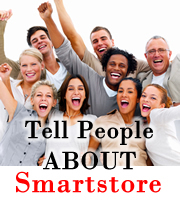 SmartsStore.com.au uses advanced encryption and state-of-the-art SSL (Secure Sockets Layer) so you can be assured that your information will be protected from any unauthorised usage . You can also be assured that your confidential information will remain confidential. If you pay by Paypal , we will be able to confirm your payment immediately and we will dispatch your order within 1-2 business days. If you pay by Direct Deposit before 6:00pm, we will be able to confirm your payment on the next business day and will dispatch your order within 1-2 business days. upto 3-4 days to clear.